From what I've seen thus far, this season takes the cake for "worst ice season" since I began ice climbing. I got out Friday and climbed in the Catskills, catching the end of a short spell of cold weather. Conditions on the thinner routes in the Devil's Kitchen were alright in the morning. By the end of the day strong sun and warm weather made for abysmal conditions. It was fun while it lasted. Purgatory, Smear and one of the corners were even lead. It sounds like there were a lot of people looking to climb in the Catskills today. The Adirondacks too. It's hard to make the right decision when you've driven a long way and want to do nothing more than to swing some tools. However, it's probably best to do something else instead. After all, it is called ice climbing because the medium we're climbing is supposed to be frozen. Do you know how much force it takes to make a giant delaminated sheet of ice fall off of a cliff? Neither do I - it's impossible to say and it's not something we can control. Sometimes all it takes is the weight of one climber to make an entire climb collapse. Positive Thinking collapsed several years ago while a climber was leading the first pitch. The leader was killed in the incident. Last season an entire slab of ice unexpectedly let go in northern Vermont on a warm day. Luckily no one was hurt. A friend watched the entire top pitch of Plug and Chug at Lake Willoughby fall off in one piece on a sunny warm day. Wow! Just remember, once an ice climb delaminates, the only thing holding it in place is the ice itself. When it gets above freezing that ice begins to act more like water. It's going to flow downhill rapidly. Next time you're considering a day of ice climbing, check the forecast. 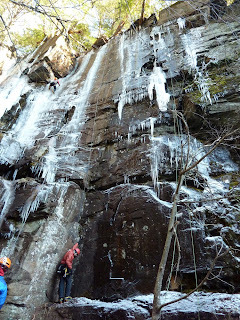 If it's way above freezing during the day and barely below freezing at night the best thing to do might not be ice climbing. Just my two cents.